Let’s say it again – no one lends a hand like musicians. They always step up to help those in need, and never more so than when the person that’s hurting is one of their own. Drummer Bobby Gagnier has been gigging around these parts since the 1960s. He played the same high school gyms as Steve Tyler back when the Toxic Twin was a drummer in a band called the Strangers, singing behind the kit and opening for Gagnier’s band Anvil. Over the years, he’s contributed to records by Pete Merrigan and Johnny Bishop, and plays out regularly with the Elmores. Bobby’s a solid anchor to any rhythm section. That’s why bands like Dr. Burma, About Gladys and the Squids routinely call upon his drum skills. But a few weeks back, a doctor spent four hours rebuilding his left thumb. The surgery will prevent him from working or playing the drums until mid-June. So Bobby’s band mates and friends are pitching in to keep the beat for him in the intervening months. 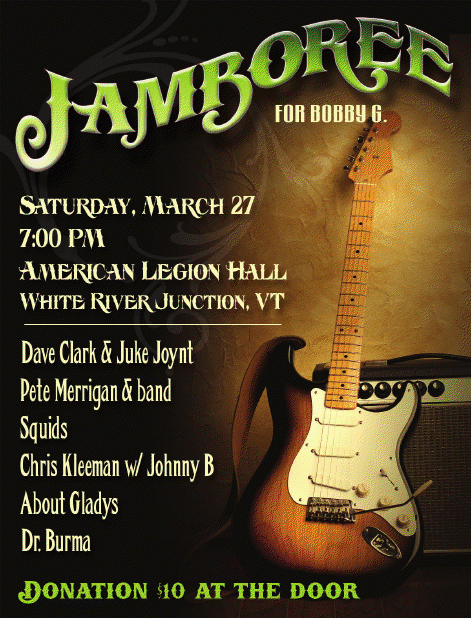 This Saturday, March 27 at the White River Junction American Legion Hall, a “JAMboree for Bobby G” will be held from 7 – 11:30 pm. Six area bands – JukeJoynt, Pete Merrigan and the JBG3, the Chris Kleeman/Johnny Bishop duo, the Squids, About Gladys and Dr. Burma – are performing to raise funds for the drummer,. Since he’s a self-employed painter and home repairman, the downtime’s been extra hard. Bobby told me he’s truly touched by the effort, led by longtime pal and Dr. Burma leader Ted Mortimer. Here’s more good news – rather than competing for crowds, the Upper Valley Dance Club is merging their regular fourth Saturday dance into the event, and offering free short beginner’s lessons during the first two breaks of the evening. A couple of years ago, a guy named Joe Peters told me something I’ve never forgotten. We should all have friends like that. For more details and tickets, call 542-6523. Thursday, March 25: Claire Lynch, United Church of Putney – A fiddle player and singer who’s been featured on albums by Emmylou Harris and Sarah Watkins of Nickel Creek, Lynch began her career with 70’s bluegrass sensation the Front Porch Band. She’s also written songs for the Whites and Kathy Mattea. Given Lynch’s gospel-infused material, it’s fitting that she and her formidable band are appearing in a church. Friday, March 26: Patsy Whelan, One Mile West – A talented Irish musician comes to the Sunapee tavern for the first of a two-night stand, joined by sideman Paul Kenney. The Dublin born Whelan has long been a mainstay of the Boston Irish music scene, loved for his fiddle and guitar playing along his humor and wit. This is a great booking for pub that, under new ownership, is showing a strong early commitment to live music. Saturday, March 27: Jamantics, Salt hill Pub Newport – A new band on the rise makes its first local appearance. The Concord-based quintet passes the ball like a musical Harlem Globetrotters, giving every member a chance to shine. I’m partial to jazz-rock that features a violin, as well as bands that rely on original material. Jamantics are prolific – they’ve released three full CDs since forming little over a year ago. Sunday, March 28: Nick Scalera, Old Courthouse – What’s brunch without a piano soundtrack? The downtown Newport restaurant features North Country Smokehouse meats, potato latkes, English scones and a tasty array of fresh juices. And music – did I mention that? Scalera plays the American Songbook with restraint, never dominating the room, but always providing a nice backdrop. Tuesday, March 30: Live Music, Windsor Station – There’s plenty going on lately in Windsor, weekend music, films (last Monday’s Movie, Martinis & Margaritas screening of Ocean’s 11 was a great way to kick off the week), and a regular Tuesday night half price burgers and music feature that usually includes solo acoustic music from the restaurant’s go-to guitar player, Gregory Brown or another equally talented player. Wednesday, March 31: Billy Rosen, Canoe Club – One of my favorite “soft touch” guitarists goes solo in Hanover, playing selections from the Great American Songbook, and channeling players like Wes Montgomery, George Benson and Kenny Burrell. There’s always great music to accompany a tasty meal at CC – 363 days a year. Previous postLocal Rhythms – No skip button for you!